Roger Federer has never won Monte Carlo, losing in three straight finals to Rafael Nadal from 2006-08. 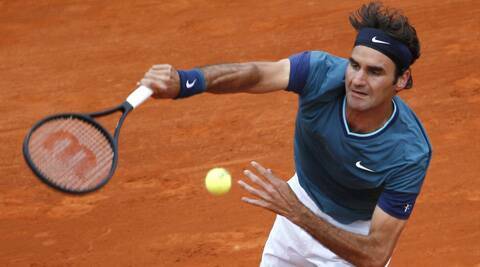 Roger Federer was happier than eight-time champion Rafael Nadal after their straight-sets wins to reach the Monte Carlo Masters third round on Wednesday. Federer took just 52 minutes to beat veteran Radek Stepanek 6-1, 6-2, while Nadal overcame a rusty start to put away Teymuraz Gabashvili 6-4, 6-1. The top-seeded Nadal, who lost the title to Novak Djokovic last year, dropped his opening service game and trailed 3-1 in the first set. But from 4-4, the Spaniard reeled off six straight games, then the Russian qualifier broke his serve again. Nadal’s body language suggested he was far from happy with his performance. At times he looked glum-faced, other times annoyed with his shots. His serve was vulnerable, too, as he conceded four break-point chances _ including in consecutive service games during the second set. He clinched victory with a crisp forehand winner. Federer, returning to the tournament for the first time since 2011, was far more ruthless as he raced to 5-0 in 17 minutes. He improved his record against the 35-year-old Stepanek to 14-2. The Czech has not beaten Federer in six years. The fourth-seeded Federer next plays another Czech, Lukas Rosol, who beat Frenchman Michael Llodra 6-4, 6-4, while Nadal plays Italian Andreas Seppi, who won 7-6 (5), 5-7, 6-4 against Spaniard Pablo Andujar. Federer has never won Monte Carlo, losing in three straight finals to Nadal from 2006-08. They can’t meet again until the final. Australian Open champion Stanislas Wawrinka, seeded third, was slightly faster than Federer, needing only 46 minutes to thrash Marin Cilic of Croatia 6-0, 6-2. Eighth-seeded Milos Raonic of Canada, No. 10 Fabio Fognini of Italy, and No. 11 Tommy Robredo and No. 15 Nicolas Almagro _ both Spanish _ also advanced to the third round. Raonic rallied to beat Lu Yen-Hsun of Taiwan 6-7 (4), 6-2, 6-1; Fognini downed Roberto Bautista Agut of Spain 7-6 (6), 6-4; Robredo won 4-6, 6-0, 6-1 against Julien Benneteau of France, and Almagro beat another Frenchman, Nicolas Mahut, 7-6 (3), 6-3.